Today as Friends and Tomorrow as apart of our Church Family. Worship Time for 2018 - 9:30 a.m.
McClellandtown Presbyterian Church in addition to Sunday Morning has other special seasonal worship services during Advent, Christmas, Lent and Maundy Thursday. 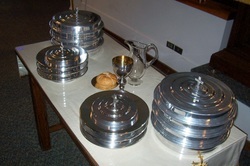 We gather around the Lord's Table about six to eight times each year to share communion in the bread and cup of Christ. Information about special services and communion times will be posted to the web site as we approach those times. Rev. McDermott also posts additional information, thoughts and videos related to his Sunday morning sermons on his blog, "The Ordinary Means of Grace." Your comments and questions are welcome.